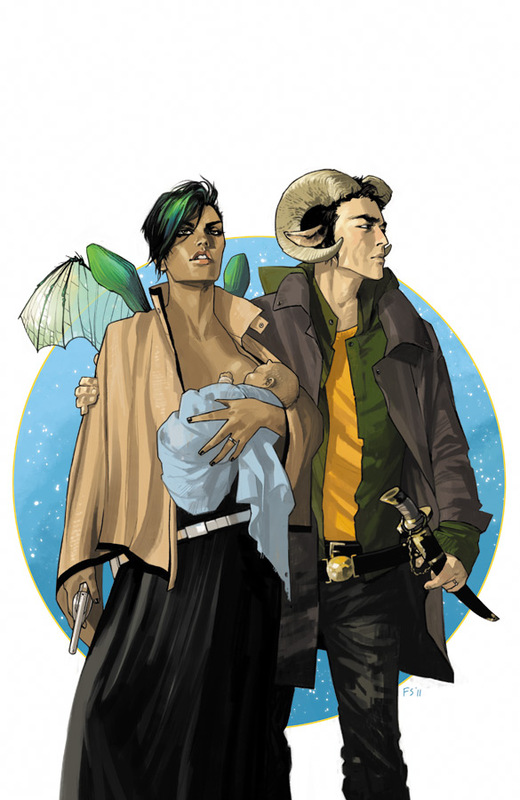 The first trade of Saga, written by the master Brian K. Vaughan and illustrated beautifully by Fiona Staples, dropped on Tuesday and if you haven't been reading this series then you need to. 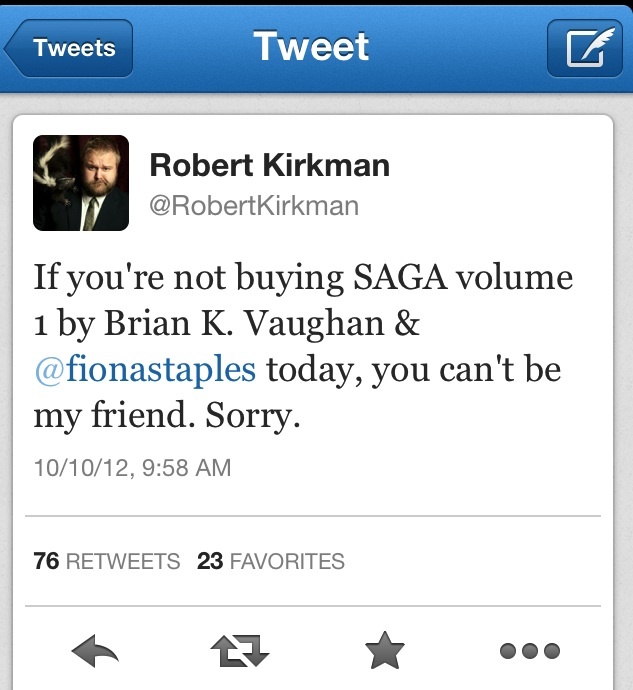 Robert Kirkman tweeted that if you don't buy Saga, then you aren't his friend. Well said. Visit your LCS or get it on the cheap here. You can also download the first issue for FREE at ComiXology here. The story is about star-crossed lovers who are attempting to flee because their love and future child are in danger. Not the most original idea, but Vaughan has this innate ability to complicate things in very interesting ways. The world he created and the complex characters are what differentiate this story from pack. Hazel, the future child of main characters Marko and Alana, narrates the tale and really draws you into the drama and the urgency of the situations at hand. Marko is a former prisoner that was guarded by Alana and little has been revealed about how they became lovers. I am hopeful that future issues will provide some of the backstory that has upset two communities at war. 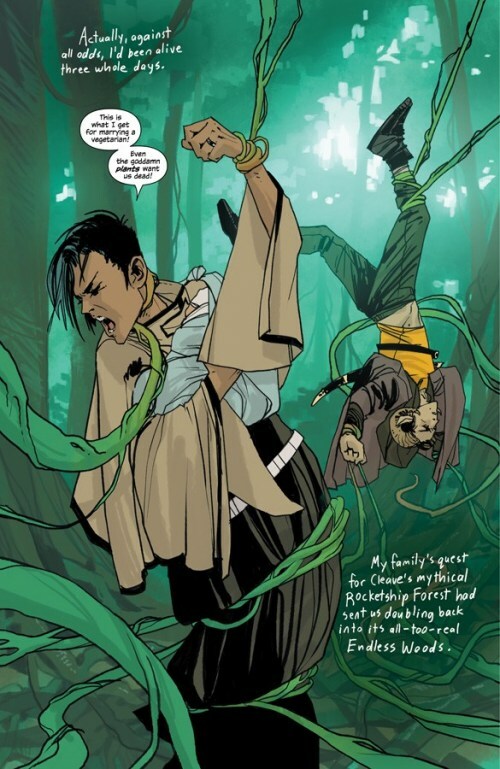 Given the hatred between the two groups, it is not surprising to note that they are interesting in stopping Marko and Alana and examining this miracle child (other children born of both breeds died very quickly). Alana’s people are utilizing Prince Robot IV’s services and Marko’s people are seeking multiple freelancers, including The Will and his Lying Cat and The Will’s ex, a spider like creature called The Stalk. We learn that The Will is more than a bounty hunter and has a lot of good and decency in him on his visit to the planet Sextillion. To complicate matters worse, the number of planets that Marko and Alana can flee to is very limited. The war has been outsourced off of the planet and there are few places that they can escape to. 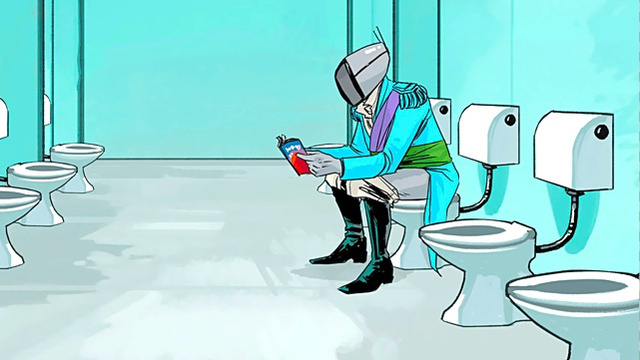 I don’t know if there is enough time to talk about how great of a job Staples has done with her illustration. It is no easy task to draw the variety of characters, backdrops and action sequences that are central to this tale. We open up with the birth of a child to start the book and quickly move to the dire situation in which the characters are thrust. Staples delivers warmth and love on one panel and then switches to horror and violence on the next page seamlessly. She captures the worlds that Vaughn has created with such charm and vigor that you can’t help but feel engrossed.